The very best way to explore this beautiful country was and will be on 4 wheels. Travellers are individuals... a retired couple enjoying the freedom of travelling over months, the young European Backpackers which looking forward to be as independend as possible on their trip around Australia or the young family who owns a Camper/RV to have great holidays. Our target is to make your journey even better and as practical, luxury or smart as you like. 10 years ago we bought our first RV and after we settled in Australia one of our first investments here was: we bought a commercial van and converted the van into a Campervan to travel on the East Coast. We quickly discovered that the RV and Campervan Industry is very popular in Australia, but on the other hand everything was quite expensive with not much choice regarding layouts. From this time onwards - with the experience we made - we worked hard to establish our own business: individual conversions for all kind of vehicles. Our ideas are to customize each vehicle to their owners need and budget. 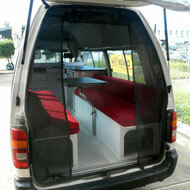 You can refurbish you beloved Camper and fit new, modern and smart appliances or replace the old worn interior. You might had a awesome 6 berth to travel with the whole family, but now the kids are grown and the layout wont need a bunk bed anymore, instead you would like a permanent double bed fitted? No problem, we will make that happen! Keen for more information about us? Please read more customer reviews about our service and work and CLICK - our everyday target is to make our customers happy!